A couple of weeks ago, my wife and I took a trip down to Charleston, SC for a long weekend. I actually grew up in Charleston, but I hadn’t been back to visit in years. I was pretty surprised at how much of the city I remembered…but then again, how quickly can a 350-year old city really change? The restaurants in Charleston were incredible (if you go, definitely make reservations at SNOB and Husk! ), and we had a great time wandering the old streets that zig-zag across the downtown area. But one of the coolest things about the trip was the farmer’s market that we found set up directly across from our hotel on Saturday morning. And the very first tent was a local farmer selling baskets of South Carolina peaches! I grew up eating South Carolina peaches…and they are by far the best peaches out there. (I lived in Georgia for several years, and I would still make a special trip to the farmer’s market there to get South Carolina peaches!) So needless to say, we picked up a peck of peaches, and that became my carry on item for the trip back to upstate New York. (The Instagram pic below is proof!) 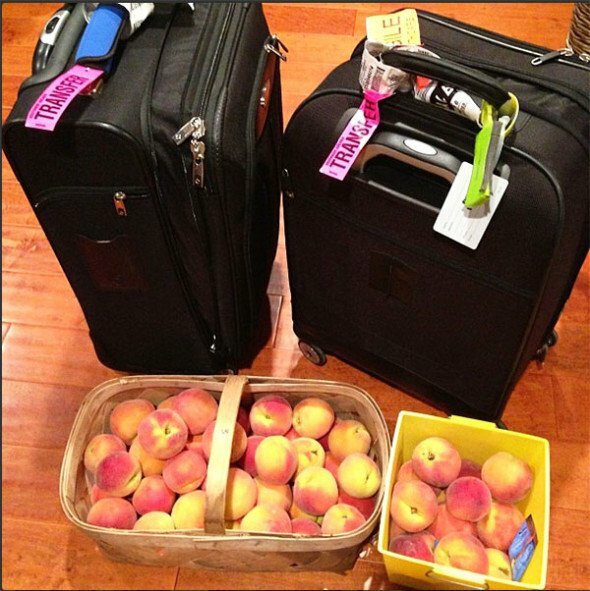 I got a couple of strange looks on the trip back, but hey…I’ll do anything for South Carolina peaches! 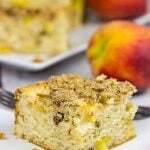 One of my favorite peach-inspired dishes is this Peach Shortcake with Candied Ginger. 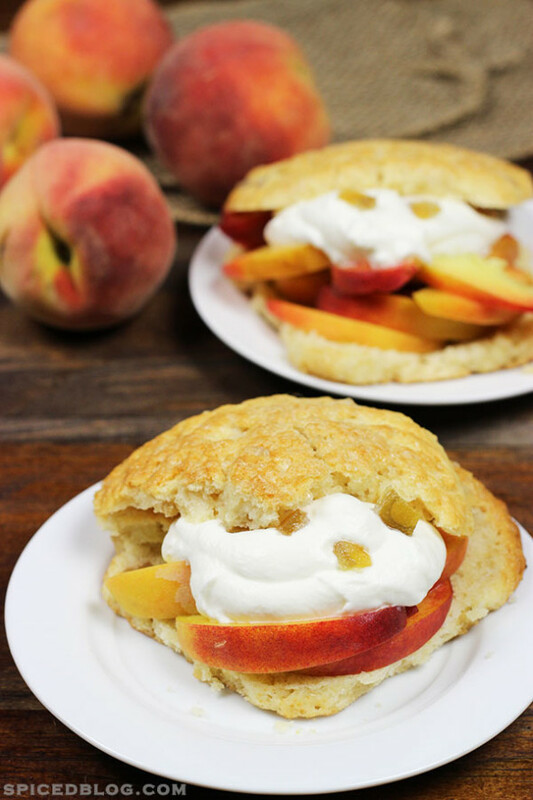 While these shortcakes are delicious in their own right, they become absolutely incredible when you pile fresh peaches all over the top of each cake. Add a dollop of whipped cream and a couple extra pieces of candied ginger, and these shortcakes could become a new favorite breakfast item in your house! 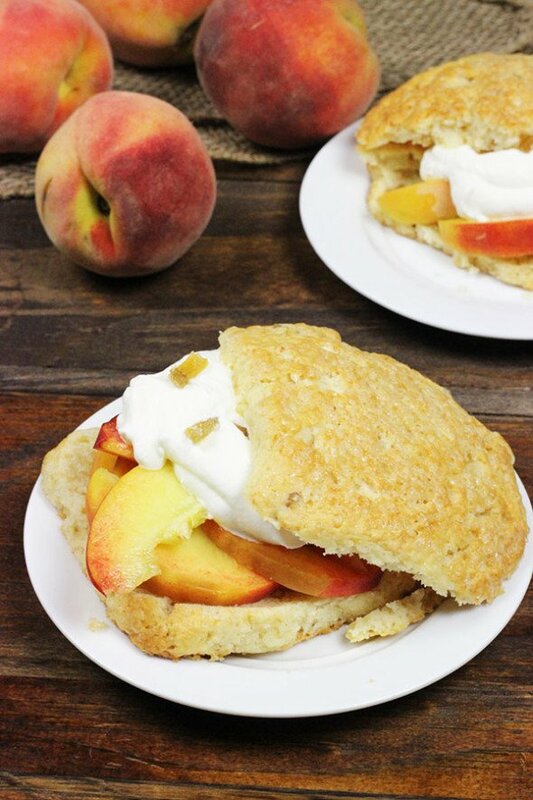 These Peach Shortcakes with Candied Ginger are an excellent dish to serve for houseguests, too. 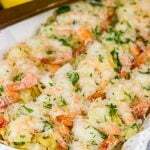 While the entire recipe does take a bit of time from start to finish, some of the work can be done in advance. 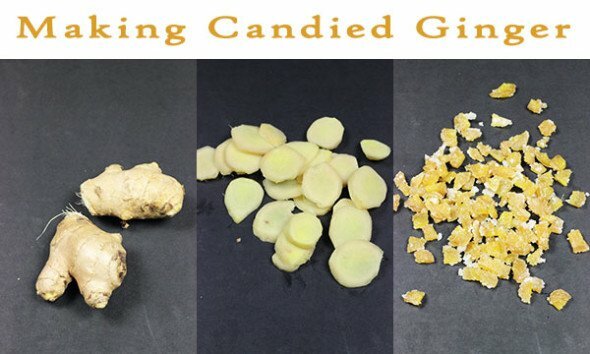 I suggest making the candied ginger pieces the day before and storing them in an air-tight container at room temperature. You could also make the whipped cream in advance and store it in the refrigerator until the next morning. The shortcakes themselves only take perhaps 10 minutes to mix and another 25 minutes to bake, so a batch can easily be made in the morning as everyone is waking up. Enjoy! Place ginger in a medium saucepan, and add enough water to cover the ginger. Bring to a boil over medium heat, then reduce heat and simmer for 10 min. Strain out ginger and discard water. In the medium saucepan, place ginger along with 1 cup of water and 1 cup of sugar. Bring to a boil over medium heat and continue to cook until temperature reaches 225 degrees F (approximately 7-8 minutes). Drain ginger and immediately toss with remaining tablespoon of sugar. 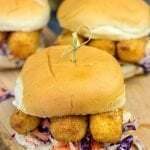 Cool ginger on parchment or a wire rack, then chop into fine pieces. Store in an air-tight container at room temperature. In a medium bowl, combine flour, granulated sugar, and baking powder. Using a pastry blender or two forks, cut in butter until mixture forms small pea-sized balls. Add 1/4 cup chopped ginger, ginger ale and 2 tablespoons of heavy cream. Toss mixture lightly with fork until dough forms a single ball and pulls away from sides of bowl. Shape dough into a 6-inch log. 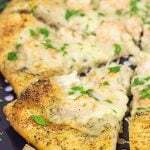 Slice dough into 6 equal rounds. Pat each round with hands until approximately 2-2.5” in diameter. Spread shortcakes out on parchment-lined sheet pan, not allowing them to touch one another. Brush tops and sides of shortcakes with 1 Tbsp of heavy cream. Sprinkle top of each shortcake with sugar-in-the-raw. Bake for 23-25 min, or until shortcakes are golden in color and toothpick inserted into center comes out clean. Allow to cool. 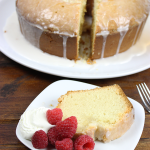 In a medium bowl, add remaining 1 cup of cream along with confectioner’s sugar and vanilla extract. Whisk until stiff peaks form. Fold in remaining 1/4 cup candied ginger. 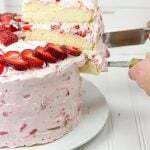 Slice shortcakes in half horizontally. 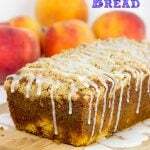 Place bottom on plate and top with sliced peaches and a dollop of whipped cream. Place each shortcake top to side. Yeah, I felt kinda rediculous carrying all those peaches home, but man was it worth the effort! !